Over a year after the 0.7.3 release, we are proud and excited to announce the release of the first release candidate towards SuperTuxKart 0.8! There have been several bugfixes since the alpha release, new music by Claude Werner (Bollen),tweaks to challenges, and some modifications to tracks (most notably a new shifting sands track, thanks to ctdabomb and kalado). Please help us test this release to make SuperTuxKart 0.8 a great release! There is also still time to help complete translations. Windows and OSX binaries are already available, and Linux binaries should follow soon (tomorrow hopefully). i cant open exeold file can you help me? That was bad timing - I was just uploading a new installer since I packaged some older files in the previous version. Just delete the old file, and use the new one, which is a plain exe file. Sorry for that! That was only missing in the OSX version :( Maybe we rushed the RC a bit. 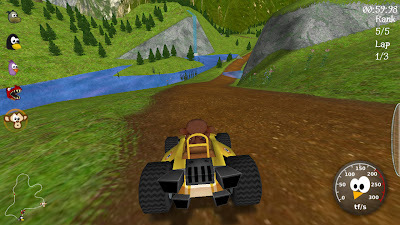 But Auria has uploaded a new OSX with the correct Sandtrack. This may be because it's disabled. Try Hacienda Edit which does work for us. We checked and most addon tracks had problems with using them in reverse - be it incorrect start positions, 'one-way jumps', or it was completely impossible to know where to drive. So the default is that a track can not be driven in reverse, and it must be enabled for each track. It's up to the individual addon designer to verify that reverse driving works (or fix their track), enable the reverse flag, and update the addon. this feature would be the one that would make to this game the big jump to the most played game in the world. After played once this wonderful game could be boring. Instead playing against friends many people will play at it all days. The fun fightimg with real people is something so different that will change the very nature of this game. I wait for years and then I bought wii and supermariokart. A pity. What...? Oh network multiplayer. That could have been fun. Until then, local multiplayer is really fun with the kids. Seriously, do you really think we don't want online multiplayer as much as you do? Fact is, 90%+ of all programming on this game is done by two people (that doesn't include me in any way. I don't program). Online multiplayer is a huge effort and isn't something we want to run blindly into without a solid single-player experience, and since there will be lots of physics interpolation for WAN and LAN we need to "finalize" kart physics as much as possible in order to not waste time redoing stuff later. In other words: keep your shirt on... it's coming as soon as it's the most logical and practical thing to do with the limited amount of resources we have. I'd love network multi-player too and the game can get boring (after a few months though) but the devs are actually working on it. Some of the stuff in the last few years is to make network possible including physics and finalizing the other system parts. And if you prefer SMK you can... just please come back some day. If you have experience maybe you can try to help. Join the forums and help discuss the game at forum.freegamedev.net. I'm thinking of learning C++ just so I can know what they're talking about and maybe fix stuff and help them. Also you can do it indirectly by helping on other stuff you specialize in and leaving time for the devs to do other stuff. What about donate. You can help. You wait for years and bought wii and supermariokart. How long did it take them to develop it to it's current point? Even if it's not open that doesn't mean it doesn't take time. Since this game is open you know when it starts. Yay! Snowtux Peak finally works on my PowerMac G5 (used to utterly fail before). Four textures have that "power of two" size problem though: snowoodbridge.jpg, tree_1.png, tree1_Low.png and wooden.png. Both tree1.png and wooden.png already exist in the textures folder and they're sized properly there, so I don't know why they aren't used instead. The snowoodbridge.jpg could easily be cropped at 512x256. It's just the tree1_Low.png that needs scaling. This is on PowerMac G5 with ATI X800, OSX 10.5.8. ...also, in the Green Valley track, w_sky_6.jpg is 1024x1023 when it should be 1024x1024. Sounds like keyboards are evil. Try a different key. Also try pressing it without pressing anything else. When I enable internet access the game crashes. Besides that. it looks GREAT. That's a bit strange. Any messages printed to the terminal? 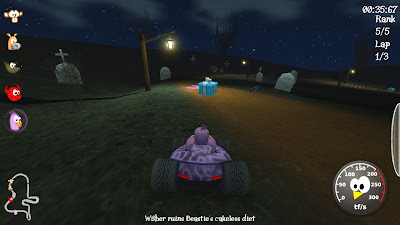 If you are on windows, right click on the STK icon and select properties, then add --log=file in Target after the double quotes ("C:\Program...\supertuxkart.exe" --log=file). When you start now the terminal should show the location where the log files are written (%APPDATA%/supertuxkart/stdout and stderr). Can you post them (ideally in our forum, since this blog is not really the right platform for this kind of support questions). I found a bunch more textures in the standard tracks that don't display properly on older graphics cards because of irregular size (not power of two). Before release, somebody should probably check all standard tracks to make sure the textures are the right sizes. There are also duplicates of some textures - in both the track folder and textures folder. Maybe that could be cleaned up. On the Star track, the moon texture isn't displayed no matter what size or file used. Also, the purplenebula backgrounds should probably be redone - they have artifacts that look hideous when magnified. I replaced mine with the much clearer star-sky.png from the Mansion track. If you guys aren't set on the koopa voice during the intro I would like to take a crack at it. I'm follwing the install instructions for Linux and when it comes to the comman "cmake .." I'm told that there is no CMakeLists.txt. I saw that there was one in the main directory so I tried to move it into the working folder for this command and it initialised something but gives me errors, most of which are "Non existent directory". I'm assuming this is because that CMakeLists.txt is to be used later and isn't the right one. It seems that its looking for a CMakeLists.txt file in the "Irrlicht" directory in "lib>irrlicht>source" only there is no file there. Any ideas? Gangnam Style...o..o..o..o...Gangnam Style....o..o..o..o...Gangnam Style....o..o..o..o..You guys doing awesome work. No binaries for Linux yet... :( could you please provide some, if possible? Whenever sometimes the music stops randomly like when choosing a normal race or by moving the window. this is enable internet access the game crashes the blog information for the useful. Hello, I'm Brazilian, and I help to create a racing game, I have a question, how to create a system of placement (1 st, 2nd, 3rd, 4th). I hope answers and help, if you know alugém to post a arquivo.blend studies. I'm sorry: Hello, I'm Brazilian, and I help to create a racing game, I have a question, how to create a system of placement (1 st, 2nd, 3rd, 4th). I hope answers and help, if you know someone to post a file.blend studies. Eu amo jogar Super Tux Kart é muito legal, já completei todos os desafios, minhas pistas favoritas são Refúgio do Norte e Green Valley e os meus personagens são o Gnu que é o chefe e o Tux que é o líder.